One of the more interesting developments in the tech space taking place right now is the emergence of digital twin technology. A digital twin, as per Gartner, is “a digital representation of a real-world entity or system”. More exactly, digital twin technology provides the ability to create a virtual representation that accurately simulates (hence twin) both the physical components as well as the dynamics and behavior of how an Internet of Things device performs and functions throughout the entire duration of its lifecycle. This is achieved by collecting and interpreting vast datasets from deployed sensors in order to realize the desired sameness between the real-world element and its duplicate. Digital twin technology has been in use in industry for some time now. However, it only recently became a major development thanks to the advent of the Internet of Things and Industry 4.0. Almost anything you can think of can have a digital twin – an aircraft engine, an office building, a water filtration system, footwear, your cat etc. So, the question that naturally arises is – why not the enterprise? BiZZdesign has been arguing the importance of a model-based approach to business change since the foundation of the company; it’s in our DNA. Now it seems the future is starting to catch up. In this webinar, we will have a more detailed look at how exactly enterprise architecture and a model-based approach help in creating a digital twin of your organization, demonstrate the benefits of such an approach, and offer examples created using the BiZZdesign suite. 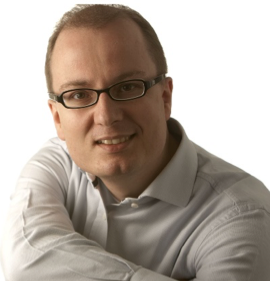 Marc Lankhorst is managing consultant and chief technology evangelist at BiZZdesign. He is responsible for BiZZdesign’s vision, market development, consulting and coaching on digital business design and enterprise architecture, and for spreading the word on the ArchiMate® language for enterprise architecture modeling, the Open Group standard of which he has managed the development. His expertise and interests range from enterprise and IT architecture and business process management to agile methods, portfolio management and digital business design. Marc has written numerous scientific and business publications and he is the primary author of two books, “Enterprise Architecture at Work”, which describes the ArchiMate language, and “Agile Service Development”. Marc is a certified TOGAF9 enterprise architect, and holds an MSc in Computer Science from the University of Twente and a PhD from the University of Groningen in the Netherlands.